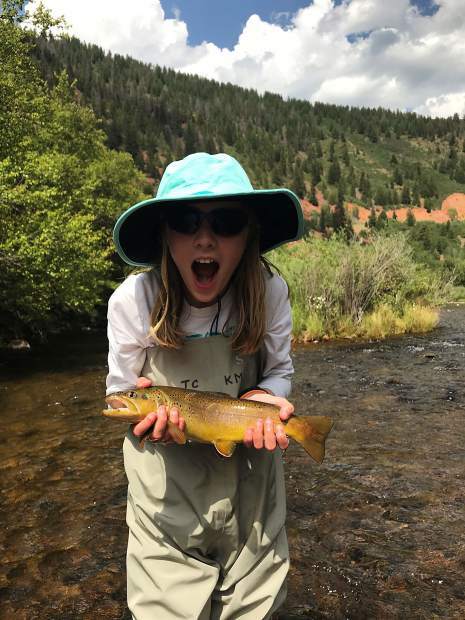 An excited angler with a brown trout caught from the Fryingpan River. Fish can be quite rhythmic, as can fly casters. If you grew up hunting, you were probably taught how to stalk, how to sneak. This translates to our fishing, or at least it should. I remember my dad teaching me to walk softly through the woods, with plenty of pauses. Nothing alerts deer to the presence of humans better than our rhythmic footfalls in the crunchy leaves. This can apply to our fishing, as well. If that fish hasn’t sulked away in utter disappointment after busting you, take a break and watch the fish. Have a snack, add a new fly or fresh tippet. Stay low, stay relatively still. When the fish gets back into its feeding rhythm, stay low and make one cast count. I’ll bet that fish will eat! As our rivers begin to drop and clear even more, hunting fish becomes easier but the catching can be challenging. Sight fishing is very similar to hunting. You need to stalk, creep and tiptoe around. If you can see them clearly, they can usually see you, too. Try sitting by the water and simply watching for a while before you wade right in. Countless times I have observed rising fish on the Fryingpan that feed off the surface every 8 seconds, 20 seconds, whatever the case may be. The next time you see a fish rise, start counting in your head and see if there is a rhythm you can sync up with. You just may unlock the exact moment to present your fly!